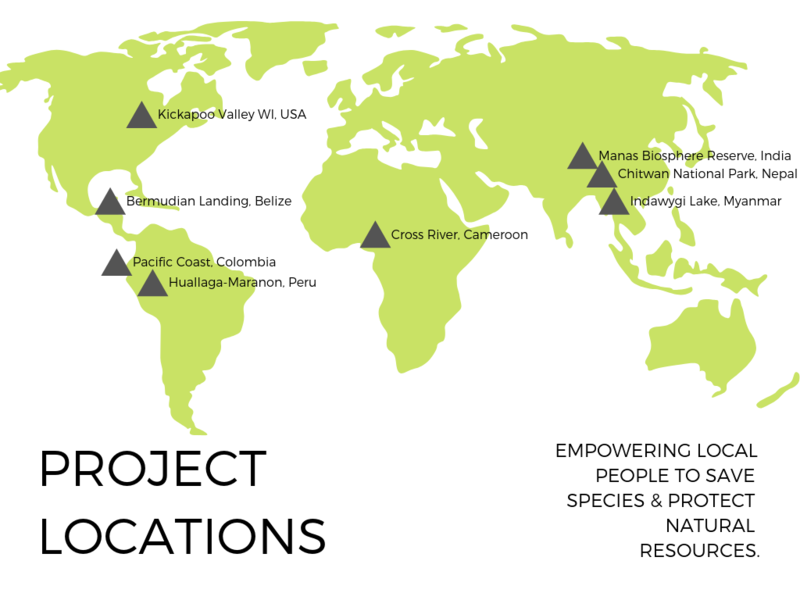 We at Community Conservation are proud of our track record of helping communities protect habitat all around the world. These are some of the projects we’ve been working on. Development of the Community Baboon Sanctuary was the first conservation project initiated by Dr. Rob Horwich and Dr. Jon Lyon, the two scientists who later joined forces to form Community Conservation. Created in 1985, the Community Baboon Sanctuary (CBS) was an innovative solution to the conservation of private lands. The CBS has become a conservation model that has spawned a new wave of community conservation projects in Belize and internationally. CBS links habitat protection for the endangered black howler monkey (locally referred to as baboon) with the human community’s need for land management and livelihood activities. The main goal of this project was local protection of the black howler monkey (Alouetta pigra) and its habitat through encouraging a stewardship ethic among landowners. It involved the participation of seven villages and over 120 individual landowners. 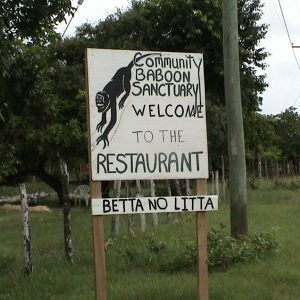 In addition to the local protection of the howler monkeys, the Community Baboon Sanctuary has spread interest in howler protection country-wide. 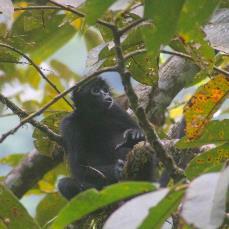 The CBS has donated howler monkeys for a reintroduction program in the Cockscomb Basin of Belize, and also contributed howler monkeys for another smaller release in the Cayo District of Belize. The existence and maintenance of the sanctuary has encouraged a great deal of research focused on the howler monkeys, the forest, the Central American river turtle, and the incredibly diverse bird community of the area. In December of 2016, former Executive Director Rob Horwich traveled to Cameroon, along the Cameroon/Nigeria border. His goal there was to work together with our partners in the field to protect the critically endangered Cross River gorilla. A subspecies of the lowland gorilla, only 200-300 individuals of the Cross River gorilla live today. For this reason, Community Conservation’s work in Cameroon is vital to the survival of this important species. In Cameroon, Rob and our Community Conservation partners in the field, including the staff of the Resource Center for Environment and Sustainable Development, met with villagers to begin the process of mapping, designing, and implementing the designation of a Community Forestry Area to protect habit for the gorillas. The initial meetings with the villagers produced excitement and much willingness to take the steps necessary to designate and manage a reserve. Unfortunately, political unrest has made it currently too dangerous to continue our efforts. We are monitoring the political environment and, when safety allows, we will continue to work with our partners in Cameroon and support the villagers in their efforts to create the reserve and protect gorillas. Community Conservation also is involved in another partnership with Neotropical Primate Conservation with the goal of conserving the habitat of the Colombian Black Spider monkey. The spider monkey is critically endangered, so it is crucial to work with the people living on the Pacific Coast of Colombia, the only place where the species is found. This project launched in 2018 and has already had many successes. Educational programs were conducted with adult villagers, children at the local schools and young adults at area universities. Also, fieldwork documented and mapped the species so that mammalogists could better understand the needs of these monkeys. In addition, agreements were facilitated between government bodies, indigenous communities and project partners to make further study and an action plan possible. In 1997, Community Conservation initiated The Golden Langur Conservation Project to protect the golden langur within its Indian range. CC partnered with Nature’s Foster and Green Forest Conservation to work to protect habit for this critically endangered species. Each of the organizations focuses on sections of the golden langur range and on specific aspects of conservation of habitat, while all working closely with the villages within their focal areas. The golden langur is endemic to western Assam and southern Bhutan, meaning it exists nowhere else in the world. 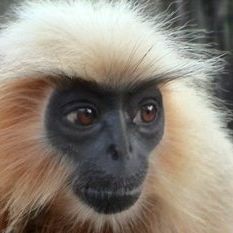 Having lost much of its habitat due to deforestation and other types of habit destruction, the primary area where the golden langur still exists is within the Manas Biosphere Reserve. This important reserve lies in lies in the western region of the state of Assam. The forests of the Manas Biosphere Reserve have been threatened by illegal logging since the early 1990s. But now, local people are working as forest guards and are integral in protecting the habitat. Under the lead of Dr. Teri Allendorf, Community Conservation is in the midst of a project aimed at involving local communities in the management of 21 protected areas throughout Myanmar. An incredibly biodiverse country, Myanmar has recently opened to the world and funds are being invested to establish protected areas. It is a critical time to develop a national strategy for Myanmar so that the voices of local communities are included in this process. In order to do this, we are piloting models of collaborative conservation activities around protected areas in Myanmar through a series of community conservation trainings for people who live near the protected areas. The trainings take place in partnership with local Burmese conservation organization Friends of Wildlife. We are also preparing a set of recommendations about how best to include community members in protected area management, to be delivered to the government of Myanmar. These pilots will serve as models at a national level for how to improve community livelihoods while also limiting threats to biodiversity. See a video about this project here. 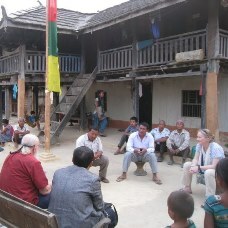 In December 2012 and April of 2013, Community Conservation founder Rob Horwich accompanied CC board member and long-time Nepal researcher, Dr. Teri Allendorf, to coordinate a workshop in a village adjacent to Chitwan National Park. This workshop was carefully designed by Teri, Rob, and their colleague Bhim Gurung, and was geared towards training community members to help in tiger management. Mr. Gurung has been carrying out tiger studies in Chitwan National Park for many years. In collaboration with Community Conservation, he has been working with community members in the buffer zones of Chitwan to teach others how to census and identify tigers through the use of camera traps and pug marks, or tracks. Community Conservation has broadened the project to work with the communities living in the buffer zone of Chitwan, with the potential of expanding the community work to other community forests in eastern Nepal. 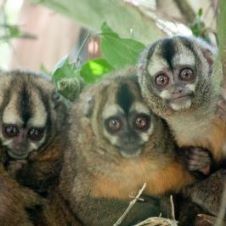 Community Conservation’s work in Peru to protect habitat of the yellow-tailed woolly monkey (Oreonax flavicauda) is directly tied to our relationship with Neotropical Primate Conservation (NPC), an extremely effective group that has been working in the Peruvian rain forest for over 10 years. Through our partnership with NPC, we have worked to create forest reserves managed by the local farmers. 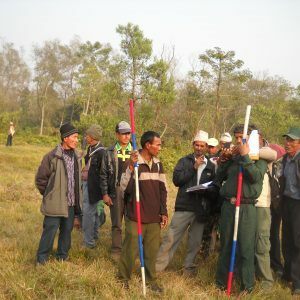 Community Conservation helped NPC to expand the project into 10 additional local communities to create a network of community-run conservation reserves. These reserves lie within the Huallaga-Marañon landscape, a region of primate endemism somewhat isolated by the Huallaga and Marañon Rivers, which covers over 70,000 hectares. The original project activities focused on the protection of the yellow-tailed woolly monkey have expanded, because of their successful outcomes, and now also focus on the San Martin Titi monkey (Callicebus oenanthe) and the Peruvian night monkey (Aotus miconax). 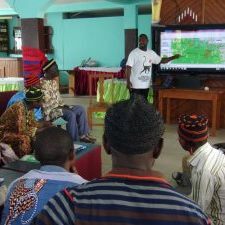 The project aims to encourage communities to obtain governmental concessions to create a connected landscape of forests. Community Conservation has our very own museum in Gays Mills, the Museum of the Kickapoo. 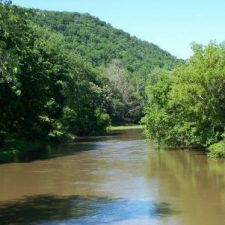 This small but friendly museum serves as an important educational resource focused on the distinctive and unique geology, flora, fauna, and character of the Kickapoo River. 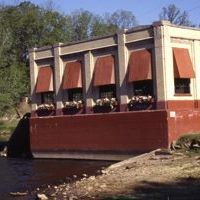 The museum is housed in the building that housed the old mechanical workings of the dam on the river in Gays Mills. The waters still slip quietly over the spillway, but the hydroelectric power-generating role of the dam is long faded into the rich web of Driftless area history. The museum was heavily damaged by the massive flooding in Gays Mills during the summer of 2018. Many of the exhibits were destroyed but some survived. Currently, options for reopening the museum are being explored and discussed. Over the years, Community Conservation has supported and helped catalyze various other conservation initiatives near our headquarters in Wisconsin. These are just a few of the groups we’ve been involved with. We’re proud to have been a part of several of these important groups’ successes.